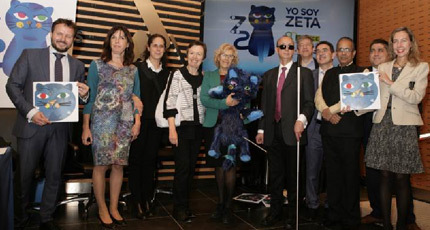 The World Blind Union (WBU) and the International Council for Education of People with Visual Impairment (ICEVI) have selected Madrid, Spain as the venue for the 2020 Joint General Assembly. ONCE, one of the long term partners of both WBU and ICEVI, will be the host organisation. WBU, ICEVI and ONCE signed an agreement to this effect on 21st November 2018 at the office of ONCE, Madrid. 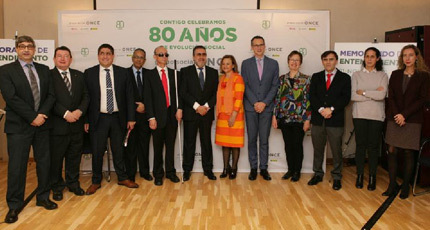 The agreement was signed by Miguel Carballeda, President of ONCE; Fredric K. Schroeder, President, World Blind Union; and Frances Gentle, President, ICEVI, in the presence of members of the ONCE leadership team. VP of ONCE, Angel Sánchez, Director General of ONCE, Alberto Durán, General Councillor for ONCE and President of Ilunion, Ana Peláez Narváez, Executive Director of ONCE International Relations and Foreign Expansion, Fernando Riaño Riaño, Director of CSR, Communication and Institutional Relations, and 1st Vice-President WBU, Javier Güemes, Technical Director, International Relations Office ONCE, José Viera, CEO, World Blind Union and Mani MNG, CEO, ICEVI. The WBU and ICEVI team also met with Ms Manuela Carmena, Mayor of Madrid, at the ONCE Special Education Resource Centre on the UN International Day of the Child, 20th November 2018. The event included the launch of a brailled children’s book and offered the opportunity to inform Mayer Carmena of the joint General Assembly. The CEOs of WBU and ICEVI will meet with the ONCE team in early 2019 to commence more detailed planning for the General Assembly. Please await further updates.